The “Smite Button” cartoon remains one of Gary Larson’s most popular offerings from The Far Side. For a twist on the cartoon, with direct application to the Ten Plagues of Egypt, see “God’s Defeat of the False Egyptian Gods” at Catholic All Year. One of those cultural icons of the post-modern era is Gary Larson’s cartoon series, The Far Side. Larson retired the series in 1995 after only 15 years, but the cartoons remain very popular. Their irreverent, bizarre depictions of people and circumstances continue to amuse, but more importantly, cause people to think about things we consider “normal”. 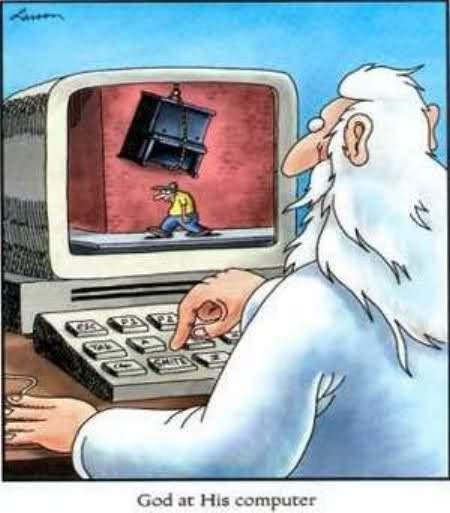 Such is the case of Larson’s cartoon, “God at His computer”. The picture shows the Almighty sitting at a computer, with an image on the screen of a hapless victim walking under a piano suspended by a rope. God’s finger hovers over the keyboard, about to press a button labelled “Smite”. There is no question that this particular cartoon is irreverent. Some might call it blasphemous. But why is it that humor is the most common reaction to this cartoon? Is it because we have this innate tendency to laugh at the misfortunes of other people – perhaps glad that the misfortune is not our own? Probably; comics and sadists have played on that tendency for centuries, all too frequently with tragic results. What strikes the chord in this particular cartoon, though, is that Gary Larson points to God as the cause of misfortune. In this case he is merely highlighting something we would rather not admit: our perception that God really does cause evil in the world, regardless how we might try to avoid it. This perception is rooted much deeper than we may be aware. Why, for instance, do contracts and insurance policies make allowances relieving the contracting parties from responsibility in the case of “acts of God”? Something like a tornado, earthquake, or other natural disaster, is an unforeseen event that no one can predict or prepare for, and thus no one can be held responsible for its effects. No one, that is, except God, the self-proclaimed Creator and Almighty Power of the universe. God, therefore, gets the blame. But why? How did this all get started? What established our tendency to think of the Creator as a capricious being ready to press the “Smite” button? And is it fair or right to blame God for misfortune? To find the answers we must travel far back in time, to the beginning of humanity’s existence. No doubt our earliest ancestors began blaming God for their problems soon after He expelled them from the Garden of Eden. However, what most likely caused us to think collectively about God in this way was His judgment on Egypt. Chazak (חָזַק, Strongs H2388): to strengthen, prevail, harden, be strong, become strong, be courageous, be firm, grow firm, be resolute, be sore. Kabad (כָּבַד, Strong’s H3513): to be heavy, weighty, grievous, burdensome, hard, rich, honourable, glorious; to be honoured, to enjoy honour; to make honourable, to honour or glorify; to cause to be honoured; to get oneself glory or honour, to honour oneself; to be insensible, dull; to be made heavy, abundant; to make heavy, dull, insensible, or unresponsive; to make oneself heavy, dense, numerous. Kaved (כָּבֵד, Strong’s H3515): heavy, great, massive, abundant, numerous, dull, difficult, burdensome, very oppressive, numerous, rich. Kashah (קָשָׁה, Strongs H7185): to be hard, difficult, severe, fierce, or harsh, to be ill-treated or hard pressed; to make difficult, severe, or burdensome; to make hard, stiff, or stubborn; to show stubbornness. Kasheh (קָשֶׁה, Strongs H7186): hard, cruel, severe, obstinate, stiffnecked. Does this mean that God is deliberately making Pharaoh stubborn just so He can bring judgment on Egypt? Not really. Remember that the plagues did not begin without prior notice. Moses and Aaron had already appeared to Pharaoh with the message from the Lord that it was time for the Hebrew people to leave Egypt. Pharaoh responded by rejecting the message, the messengers, and the One Who sent them. 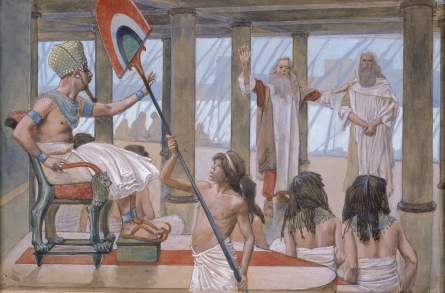 Then he took steps to demonstrate his power over all Egypt and everyone in it by increasing the Hebrews’ workload. That was not only an action to show his power over Israel; since Pharaoh was worshipped as a god, he was demonstrating his power over the God of Israel. In other words, he had already determined in his heart what he was going to do, which brings us to the most important of these five Hebrew words: chazak. And Jehovah saith unto Moses, ‘In thy going to turn back to Egypt, see–all the wonders which I have put in thy hand–that thou hast done them before Pharaoh, and I–I strengthen his heart, and he doth not send the people away;’ (Exodus 4:21 YLT98, emphasis added. See also Exodus 7:13, 22; 8:19; 9:12, 35; 10:20, 27; 11:10; 14:4, 8, 17. In this passage Paul uses the word sklērynō (σκληρύνω, Strongs G4645). The translators of the Septuagint (LXX) used sklērynō for chazak in Exodus 4:21. In the Apostolic Writings (New Testament), five of the six uses of the word refer to actions of individuals in hardening their own hearts (see Acts 19:9; Hebrews 3:8, 13, 15, and 4:7). Thus, Paul’s use of sklērynō in Romans 9:18 is in the same sense as chazak in Exodus 4:21 – God confirms or strengthens people in the choices they have already made. Remember that God is able to see all of time all the time. He knows our choices and the consequences, and He will not stand in our way to prevent our choices. He will have mercy on us if we meet him even part way. He even had a measure of mercy on wicked King Ahab when he repented of plotting with Jezebel to murder Naboth the Jezreelite and steal his vineyard (I Kings 21). However, if there is no repentance, God allows the consequences fall on us. If Pharaoh had repented, God would have blessed him and would have gained great glory through the salvation that would have happened in Egypt. 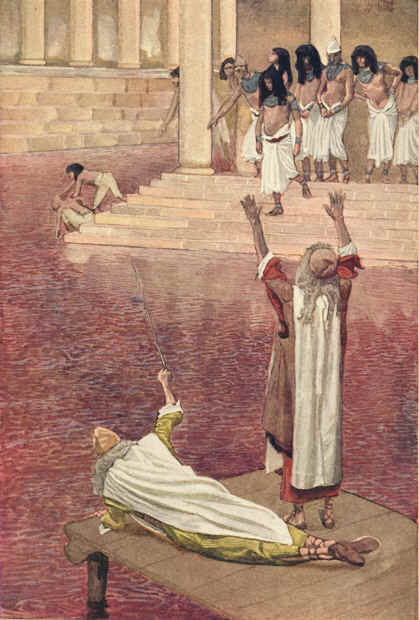 Such was the case centuries later in Babylon when Nebuchadnezzar repented before God (see Daniel 4), and in Persia, when Cyrus let the Jews return to Jerusalem and rebuild the Temple (Ezra 1). Cyrus was prophesied to do this long before he was even born (Isaiah 44:24-28, 45:1-7). But what if Cyrus had chosen to resist God? In that case he and Persia would have suffered judgment just like Egypt, and the people would still have returned. God would have been glorified, but not in the way He preferred. The point is that God is not capricious, impulsive, or unpredictable. He does not want us to do evil and does not create us with that purpose. However, we have the capacity to do evil because God has created us with free will. He created Lucifer with that same free will. Lucifer made his choice, and God confirmed him in it, and thus the Son of the Morning Star became Satan, the liar and murderer (Isaiah 14:12-21; Ezekiel 28:11-19; John 8:44). Since God is outside of time, He can see what we will do. That is how He can declare the end from the beginning (Isaiah 46:9-10). So perhaps, when we ask how predestination works, we should look not so much on God’s actions, but on our own. Please click here to return to the beginning of this series. Please click here to return to Fox Byte 5775 #13: Shemot. Please click here to continue to Fox Byte 5775 #15: Bo. Please click here to return to the Fox Bytes 5775 menu page. © Albert J. McCarn and The Barking Fox Blog, 2014-2015. Permission to use and/or duplicate original material on The Barking Fox Blog is granted, provided that full and clear credit is given to Albert J. McCarn and The Barking Fox Blog with appropriate and specific direction to the original content.